This colourful giant lily was commissioned to go on an eight foot wall behind a bath. I painted the artwork on seven pieces of paper in order to get the best resolution. Below you will see the route from artwork to making the grid and the final tiles are here. 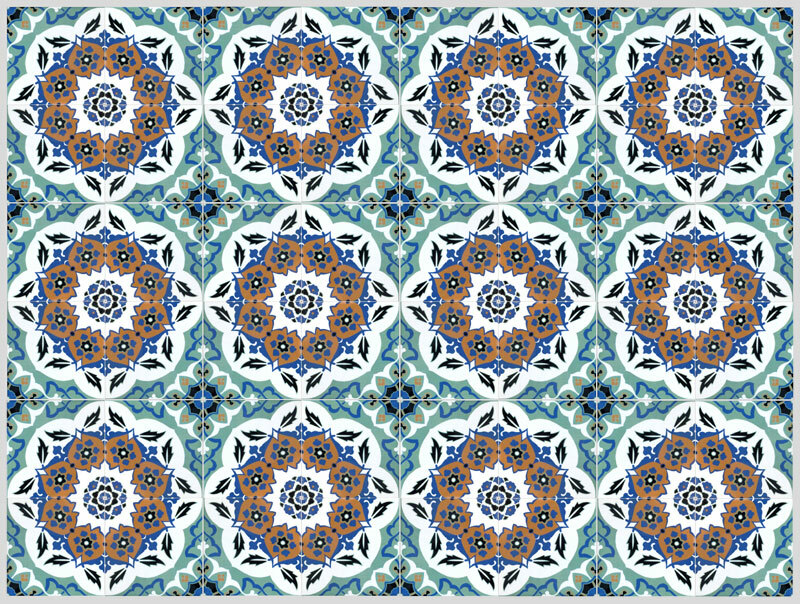 I made these tiles so that four would make up a single design which would then tessellate to create a wonderfully colourful panel of tiles as in the image below. This group of tiles was commissioned specially on 200mm x 200mm tiles. The design was hand painted on paper and then prints were created and applied to the tiles. The result made a fabulous colourful panel. Tiles by TexTiles undertakes individual commissions using blockprinting or digital printing techniques on our handmade or pressed tiles. If you want something specific or need a complementary design for a wallpaper or fabric, we can help. We have put photographs onto a panel of tiles or simply created a customized design. All our special commissions are individually priced - please contact us for a quote. Scroll down to see what's possible.